The fires are being allowed to burn in North Kaibab, Tusayan and Williams ranger districts of the Kaibab National Forest. Forest Service officials have said these managed fires help accomplish multiple objectives considered beneficial for the area. These objectives include reducing accumulated forest litter and fuels, maintaining fire in a fire-adapted ecosystem, increasing firefighter and public safety, and protecting cultural resources and wildlife habitat. Williams Ranger District: Currently 40 acres in size, the Sitgreaves Fire is located approximately 5 miles northwest of Parks, Arizona. Fire crews will continue to back down the western and southern slopes as it burns through forest pine litter. To plan for fire growth, officials have identified a specific planning area of approximately 14,800 acres in which the fire could spread. Smoke may be highly visible from Interstate 40. Currently 188 acres in size, the Duck Fire is located approximately 3 miles northwest of Parks, Arizona. Fire growth has become more active due to drier conditions. Smoke is highly visible from I-40. North Kaibab Ranger District: Currently 6 acres in size, the Quaking Fire is located approximately 76 miles southeast of Fredonia, Arizona. To plan for fire growth, officials have identified a specific planning area of approximately 1,100 acres in which the fire could spread. No smoke impacts are anticipated at this time. Tusayan Ranger District: Currently 625 acres in size, the McRae Fire is located approximately 5 miles southeast of Tusayan, Arizona. To plan for fire growth, officials have identified a specific planning area of approximately 11,000 acres in which the fire could spread. Friday, crews are planning 400 acres of managed ignitions as needed within the planning area. Smoke may become highly visible from Highway 64. 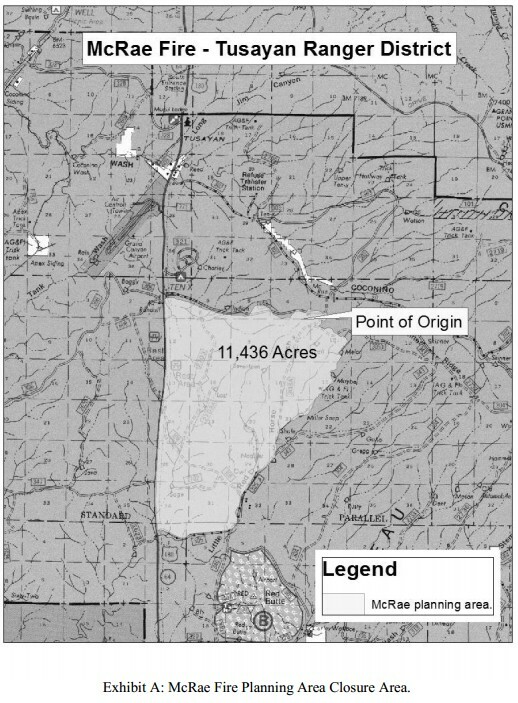 For firefighter and public safety, the Kaibab National Forest has closed the 11,ooo-acre McRae Fire planning area to all public access. The closure went into effect at 8 a.m. Friday. It will remain in effect until rescinded or until Aug. 15, whichever comes first. Previously burned areas may continue to smolder and hold heat for many days. Burned branches may fall from standing trees. Burned stump holes may not be visible because of ash and dirt. Firefighters may be actively burning through managed ignitions within the planning area. “76 miles southeast of Fredonia” is a useless description of the location of a fire that would be south of the Grand Canyon somewhere. Get a little more specific here, please.